I started some seeds 8 days and as you can see from the above photo they've all sprouted (no duds, so I'll have some vegetable plants to give away). Right now there are only pepper and eggplant seeds in the tray. 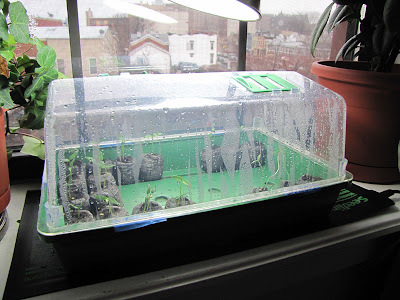 In about a week I'll start the tomato seeds and a few weeks after that I'll start the cucumber and cantaloupe seeds. I'll be planting about the same amount of plants I did in the 2009 container garden, but given what I've chosen to grow I'll probably surpass last year's 57 pound vegetable harvest. This year I'm starting fresh with all new seeds from Johnny's Selected Seeds, a company based in Maine, so I'm certain anything available on their site will do fine in my area. No peas on the rooftop this year, I've decided I don't like them enough to actually grow them in the limited space available in the container garden. They're being replaced with cantaloupe. Melons are new territory for me so I'll be observing them closely for the entire growing season. This will be my 3rd attempt at growing cucumbers. Last year's seed never sprouted, the year before that they died from powdery mildew, so I really really hope this year's attempt works out. I haven't decided if want to track the market value of what vegetables I harvest this year, but I'll continue to keep track of my expenses. And so it begins, There is a hole in your mind... Sorry classic Babylon 5 line there. I'm looking forward to how this turns out. Those Peat pots are awesome to work with. We tried making our own this year out of our compost so time will tell. Every little bit helps. Take a look at our site if you want to see how to make these grow from two liter bottles with little room. Hey Greg, the jiffy pots are definitely much easier to deal with than loose, seed starting mix. Happy Spring. 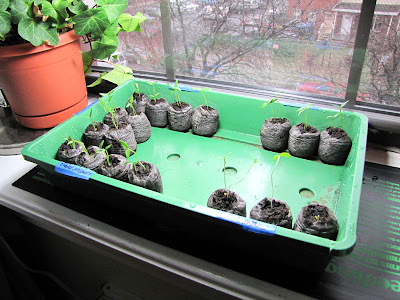 Going to tackle growing peppers too this year, so thanks for the info on what you have planned. Good luck with round three on the cucs. Johnny's looks like they run a good business, and they ship to Canada. Ever had any problems? I've never had any problems with Johnny's and I would recommend them to others. I do wish they had more container friendly vegetable seeds though. I've liberated the garden from vegetables this year. I will grow vicariously through yours.